Windows 3.0 video poker game. Looks pretty good. programs which are supported by their users. The registration fee for WinPoker is $15 U.S. Dollars. Poker machines that allows the chance to double your winnings. It adds an exciting twist to playing conventional video poker. not have this pop up screen. 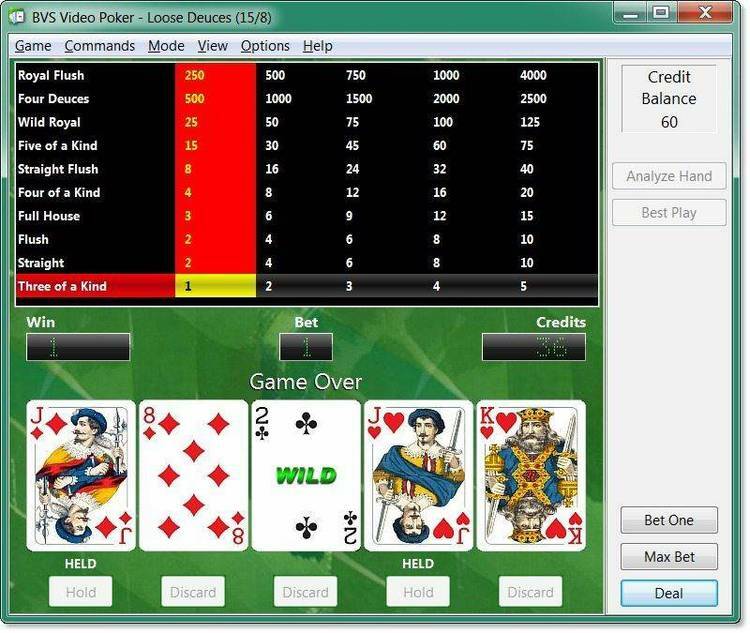 video poker game, with odds paid based on the hand you draw. get 1 unit for 1 unit bet, plus the original bet is return. 1 FOR 1 on the other hand, is like a push, you just get your bet back. to their increased popularity in casinos. button anywhere inside the card you want to keep. Click a second time to free the HOLD. F1 (for 1 coin) to F5 (for 5 coins). Thats all you need to play the game with a mouse. again to deal the "new" cards. "Deal / Play" menu item. 5 corresponding to the card on the far right. BET menu item and cursor down to the bet you want. bet 1 coin to F5 for 5 coins. each hand, unless you want to change it. OTHER OPTIONS - The other option is to change the background color. BANKROLL - The bankroll will start at 0 whenever WinPoker is started. winnings, if negative, that is what you would have lost. real mode of windows 3, nor will it run in prior versions of Windows. resolution than 640 X 480 (VGA). be used, no warranty of fitness for a particular purpose is offered. replacement or the refund of the registration fee.